The Gunn brothers Shotgun Politics exploded into their set with openers ‘2003’ and ‘NYD’. These tracks contained snare heavy punk beats and simple bass lines which associated most with Green Day, whilst the guitars infused understated College Rock and early 00’s Americana riffs in the ilk of Wheatus and Weezer. ‘Sunny’ began with a solo beat, similar in style and tempo to The Knack’s ‘My Sharona’ before palm muted descending guitar lines took the front seat. This song had more of an indie/emo vibe with reverberated guitars, an almost glam rock solo, and a chorus that contained elements of We Are Scientists. ‘Hands’ and ‘St. Denis’ took Shotgun to the more anthemic side. After a haunting feedback guitar similar to U2’s ‘With or Without You’ by Kid, ‘Hands’ showcased a softer side, with mellow chords in the verses, allowing for more freedom with the bass in the vein of Kings of Leon, as did the rhythm guitar later, akin to ‘Supersoaker’. Meanwhile the drum pattern was a dead ringer for New Order’s ‘Age of Consent’. ‘St Denis’ involved a huge crowd singalong, despite the song itself being relatively simple and straightforward. As singer Timmy Gunn invoked a crowd battle, drummer Freddy couldn’t refrain from getting involved too amongst the audience before crashing back in with the other members for a huge ending. ‘5 In The Morning’ was a new song which saw western shuffle guitar rhythms over a dancey off beat hi-hat pattern, as the vocal melody followed the lead guitar in unison. The bass parts were also more intricate by Jimmy, showing the band at their most complex and original. Encore ‘852’ created a clear Paramore resonance, but became infectiously visceral by the end with swirling guitars, whilst drums and bass locked in to keep the whole performance stable. As the song and set climaxed, Freddy stood up from his stool with cymbals crashing, and collectively making Shotgun Politics one of the most visually excited acts to have set foot in The Hub. Old hands Shotgun Politics steered their Underground 118 show with the kind of confidence that comes from playing eight of Chris B’s nights. After Still Minds’s serious and rather emotionally intense performance, Shotgun’s arrival signalled it was time to shake loose. Launching from the catchy, shouty opener 852, it was business as usual for the foursome, with a spectacularly fun set of loud, brash songs, big choruses, and earworm riffs. The band’s sound simultaneously straddles the more serious sounds of ’90s emo and the kind of party-starting pop punk associated with Fall Out Boy and Green Day. 5 In The Morning and No Time To Surrender – all choppy riffs and headbang-inducing guitar – were introduced as new songs. With his mesmeric, sparkly green guitar, lead singer Timmy Gunn was a charismatic frontman, checking in with the crowd, ticking off the promo and acting as tour guide through a whip-cracking succession of seven songs. For last song St Denis, Gunn commanded the crowd through a skin-tingling singalong of “woahh woahhhs.” Every single person in the room joined in. It was a melody – and a set – that few will forget quickly. Even with the excellence that ensues in the form of Galaxy Express or Dr. Eggs, I’d still have to say that the climax of Friday Night Rocks materialized in the form of Shotgun Politics. Not only was their music fantastic, but they also exhibited an enthusiasm that was contagious in the air and infected all the audience members in the crowd. They were very, very good at creating atmosphere; if they had wanted to and had it been allowed, I would not be surprised at all to see us all moshing. One second we were all still sitting on the floor, lazily bobbing our heads to the music; the next Timmy got everyone up and at the front of the stage, crowded at the feets. The band had echoes of influences of the hard rock/metal of Disturbed and Atreyu, and their stage presence was Slipknot-level crazy. The band began with the energy pumped Chucks + Pearls, followed closely by the catchiness of ‘turn it up, turn it up’ in Sunny. Hands got everyone clapping their hands along; the quiet intro showcased the purity of the rawness of Timmy’s vocals, while the song also went on to exhibit a wide vocal range as well as the talents of the backing vocals in an overlapping sequence. “We’ll be alright we got our hands up in the sky”, indeed. 852 was a personal favourite that had everything I enjoy in a good rock song: incredibly catchy but not bubble-gummy enough to borderline on pop punk, solid vocals, and a great guitar solo. London Town was the last in the set, a ‘party song’ that featured an epic finish. Putting together their talents in music and songwriting with their contagious energy in a live performance, Shotgun Politics was, without a doubt, the most fun and enjoyable act that evening. Shotgun Politics. The fifth band of five at the Planetrox China final, and if the order was drawn at random then the gods of rock knew how to script it: save the best till last. Assuming the audience response was an indicator of which way the popular vote went, it wasn’t just the three official judges who were responsible for these boys walking away victorious, clutching their oversized boarding pass to Canada in lieu of the classic novelty cheque. How did they do it? Their set was a barrage of upbeat, anthemic, radio-friendly, good-times rock ‘n’ roll. Like an inexplicably awesome, bizarrely loveable, illegitimate lovechild of Matchbox 20 and Blink 182. Well, whatever it was, it was fun. The group’s energy was huge and filled the venue. Regular shout-outs to the crowd made it a real love-in at the front of the room, bolstered by singalong chorus after singalong chorus. Want a catchy, uplifting lyric? Try “turn it up, turn it up, turn it up,” “hands up in the sky,” “one more chance, one more try,” “can’t stop, no” … you get the idea. Not only was every band member singing in chorus by the end of the set, but the lagered-up college football bros in the audience were practically mosh-hugging in joy. All that aside, this was a serious performance by some of HK’s finest. Lead vocals are delivered with power, aplomb and showmanship – it’s a great voice used well. Guitars and bass are tight, every one playing their role but also capable of busting out a strong lead when called for, and very well-drilled as a group. And this review would not be complete without mentioning Freddy on the drums. I have never seen a happier drummer in all my days and I probably never will. Singing along whether there was a mic in his face or not, he spent half the show literally out of his seat, unable to contain his enthusiasm and belting the drums from a standing position. Not to mention declaring his love for the audience between songs. We love you too, Freddy. It was a strong and diverse range of bands at the China final, but there wasn’t really much doubt which band had inched ahead of the pack. Shotgun Politics have all the tools and charisma to play on the bigger stage, and tonight’s show and reception confirmed it. Well done guys. The second band too were returning veterans playing with us after a long time, and just like Dark Himaya, they had made a series of changes to their set too. In a strangely similar parallel, Shotgun Politics too have added intros to their songs; evidently the idea was to play a nearly continuous set. It didn’t quite work out this night (considering the energy of their shows, I would think they’d need a little time to breathe after every song), but I’m sure they’ll figure it out eventually. Regardless, the intros they have crafted to each song add a nice taste of something slightly different before the actual song, which is a great approach, and also allows some of the more compulsive elements of playing an instrument to come out; from little wiggly bits on guitar to interesting drum vignettes. It’s a great idea and I’m interested to see how they’ll develop it. The second most noticeable thing about them is that they now have another new guitarist, and they have surprisingly found another person whose soloing style is noticeably different from Timmy’s – Kid sounds like Niall with more gain and has a Noughties metal, chugging style to his playing, which complements Timmy’s well (again). If this is subconsciously done, their subconsciouses are very attentive. They’ve also got a substantially different set from the one they played last time, and this is generally true of every time they have played, and they played quite a few new songs this night. However, the classic Shotgun Politics energy was there in spades. Right from the stop-start, jumpy rhythm contour ofSunny, making it sound much like an early Nirvana song, to when Dr. Eggs himself joined the merrymaking on stage for New Year’s Day, until the grand closing notes of the anthemic 852, it was just as intensely fun to watch as always. Aside from having terrific musicians and live shows, they must be complimented on how far Timmy has come as a (mostly) lone vocalist. He’s become a fine singer, with a slightly edgy but melodic voice which suits their songs great, and he’s been able to develop its quality into a flair that really shines; this night, especially in the heavier Chucks and Pearls. Hands, their “dancey” song, showed off the more shimmering side of Kid’s soloing style, complementing Timmy’s very melodic pieces. Break started off quite mellow, and perhaps underscored their newer sound with a slower pace of words but fast-strummed notes, at a generally mid-tempo. Cathartic was composed by Kid, and it shows (I think) by having a more In Love & Pain-kind of sound. They closed off with their two more anthemic songs, and with some more of the classic SP madness on stage, got the whole crowd going. Not much more needs to be said about them, but I will say this – these guys are awesome. Shotgun Politics, which describes itself as a party rock outfit, has always been known for its ability to whip the crowd into a frenzy, and this night was no exception. After politely requesting the lighting tech to turn down the lights to make the stage cooler, the band proceeded to deliver an upbeat set of eminently danceable tunes at breakneck speed (that’s presto to the classically minded amongst you), featuring some of the popular tunes from the band’s two albums such as New Year’s Day, Johnny Rage. Only at the request of Freddie Gunn, who was probably close to exhaustion from having played two sets, did they take a breather with a slower tune (slower… at allegro), a new song, aptly named “Break”, which made me think must have been written for this very purpose. This was the second time that I’ve watched Shotgun Politics since the sad departure of the lead guitarist Kevin Ronquillo. It must have been a daunting prospect for the new lead, Kit (of In Love & Pain!) to follow in the footsteps of such an accomplished guitarist, so it was good to see him settling into the band and making his own distinctive mark on the music – I have no doubt that Kevin would approve of his successor. With the new lineup, the Shotgun Politics has lost none of its lustre and can only go from strength to strength to entertain the public for a long time coming. 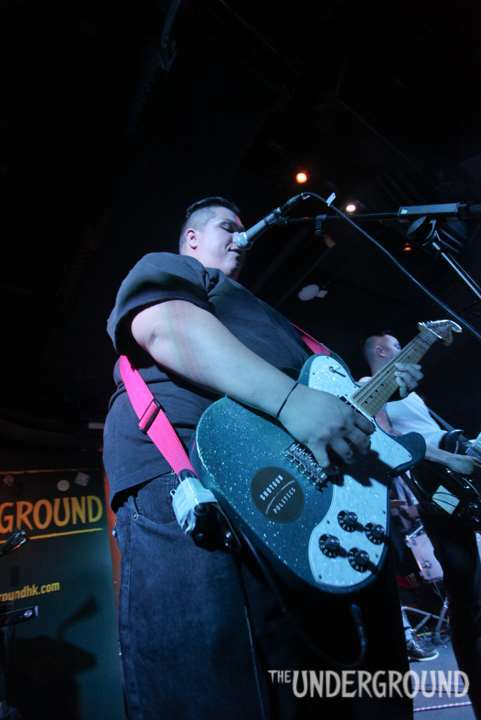 Holy cow, it was fricking great to play at The Underground CD4 release party. Thank you for having us at the event and on the CD! The Underground people managed to book up the newly opened Hard Rock Cafe and it was sweet sweet sweet. Awesome amps, awesome PA, drums from heaven, and great staff. We had a great time playing there, and honestly can’t wait to come back. These compilations really are a great way to document the local scene, and after listening to #1-3 repeatedly we were stoked to be a part of #4. Thank you everyone for making it happen, we’ll be in the audience for #5! Speaking of showing audiences a good time, I’m going to go out on a limb and say that SP must rank among the best of HK bands with this ability. They’ve got tremendous stage presence, due in no small part to the utter commitment and energy with which each set is played – which is invariably contagious. It also helps (a lot) that their style is one of the most visceral rock ‘n’ roll, overlaid with thick punky tones, rounded off with the pithy riffs of good garage-rock – a highly potent combination, much like the one that the Fleshtones have been using for many years with great successs. Also like the Fleshtones, they are a consummate party-band, but never reduced to being merely that. I must admit that I have on occasion wished (loudly) that they reintroduce their excellent Johnny Rage into the sets; however, on contemplation I realise that its non-inclusion is a move that allows their sets to be very different from their earlier ones – a sign of a band that is on the move towards new things. So, kudos, guys, good on ya. They seem to have made a ritual of opening with Rebel Radio, and this night was no exception. The (slightly borrowed, and) very hummable song was a perfect start to the set, which quickly moved into Paper Heart – a ripping number that got everyone there on their feet (about damn time too!). There’s so many things going on when they play that you must watch as though entranced for fear of missing something cool; and Timmy’s jumping off-stage to rock through the crowd was just one more thing to watch. Between that, the exchanging of leads, the fact that drummer Freddy has the energy to sing along every lyric while still punishing the drums (in Dan Peters style) at warp speed, and the ironically still figure of Jimmy on bass, you’re totally spoilt for choice visually. It’s rare that both guitarists’ instruments detune after a song, but evidently I underestimated the magnitude of power put into playing their axes – consequently, both Timmy and Niall had to retune before Glow, whose garagey powerhouse riff kinda reminded me of the Wildebeests, and was a perfect instance of how catchy their songs can be. This was significantly augmented by their very different soloing styles and contrasting guitar-tones, which provide a real punch to the songs. The activity ‘til this point was clearly sapping, as both singers needed to recharge a bit, while we were treated to a drum solo before the madness of Carry On – this point forward, their set really escalated; which made up for the fact that it was, honestly, their most generic-sounding song. Strangely enough, despite the fact that 852 was a slow, mildly syrupy pop-rock ditty, it didn’t reduce the vigour of the set, and had an awesome solo to boot. The energy they regained during it was to come in use, because they really pulled out all the stops as the snaky, spiky riff to London Town began. Not only was there drumkit-jumping (by Niall – good thing he didn’t fail to get his leg over, unlike a certain Sir Ian Botham [you cricket fans know what I’m talking about…]), running out into the crowd, and generally convulsive behaviour. During the irresistibly sing-along-able outro (reminiscent of the Ig’s The Passenger) they actually got the Sleeves’ Bee on from the crowd to play out the song! A fantastic ending to an awesome set, that only raised the standards for the night’s act to follow. Next up is a bunch of four guys from a cool little band known as Shotgun Politics. I saw these guys live at GBOB and thought that they had a lot of energy and charisma, so I was interested in seeing what their full set would be like. The band consists of Niall guitar/vocals, Timmy guitar/vocals, Freddy “Mercury” on drums and Jimmy on bass.“Let’s get ready to party!” screamed Timmy and the band began to entertain us with their form of party rock. Everyone stopped their conversations and heads turned towards the stage as the pop punkish styling of Shotgun Politics filled the air. The song had some cool guitar riffs and the drummer was especially awesome. “M-I-K-A” I thought I heard Niall sing, later to find out that it was actually ‘N-I-K-I’. The song was over before you even knew it, it had built up and built up and then it was suddenly finished. More I thought. The crowd loved it too. The second song, ‘Rebel Radio’, started off with some nice guitar chords which sounded a little bit familiar. Listening to this song was like listening to a song by Jet. It was full of energy and I enjoyed listening to the entertaining lyrics. I especially enjoyed the ending when Niall sang “Play it loud and all night long! All night long! All night long!” The band got an even bigger applause than the previous song.In the third song, ‘Pill’, I thought that the vocals were too low and I wanted to hear what Niall was singing about. This song had a nice tempo and reminded me of the early days of Offspring when they were more punk rock. This was a song you could bop your head to and dance. Actually, the guy on the other side of me is finger dancing to the song. Lol. The band is so energetic and every single one of them holds a lot of stage presence. It was hard not to like them.We carry on to the next song which is, ‘Carry on’. This song started off much slower than the last song. Timmy sang in this song and I thought that it was awesome as I wasn’t expecting him to sing. I think that’s what blew me away. He had a nice sweet and gentle voice. When the song gradually picked up pace and got heavier I could feel my leg shake in time with the music. At this stage Timmy started singing using more of his rock voice, then more guitars and once again it was over, while we were still begging for more. By now I was thinking that they never actually introduced any of their songs? Or was I just not listening? Their next song started off quite like a marching song, something similar to The White Stripes. The bass was awesome in this song, though I did think that the vocals sounded abit weird. This song ended with the lead guitarist standing on one of the large speakers and jamming it out until the end with the drummer.I heard the name of this one, ‘Johnny – (something)’… ‘Rage’. This song started off like a Guns & Roses type ballad. Timmy and Niall shared the vocals for this song. Then the timing of the song changed and it built up speed. The chorus of this song was very addictive and I kind of wanted it to repeat a few more times so I could do some head banging. Then it ended with some sweet and alluring plucking of the guitar. For their 7th song they asked Chris B to join them to sing this song. I was not sure what to think? What should I expect from this crossover? Were they going to play a Shotgun Politics song or a Chris B song? The song did start off familiar, yet different. Then, I heard the chorus and the familiar line, “masturbating to a magazine’ and I realised that I had heard this song already tonight. It was a TOL song. They played the song with respect, but were just lacking the sax styles of Mysterious B. The crowd cheered loudly.They announced their last song, ‘London Town’ which started with heavy guitar. There was a good pace to this song, very catchy and head bopping. There were so many people jumping up and down on the dance floor by this stage. This song had some interaction with the crowd too with us echoing to some ‘Hey! Heys!’The song ended with some lovely ‘woahs’. I was actually sad to see them leave. They had an awesome set filled with songs of mixed variety. Their performance was both audibly and visually entertaining. They are a still a young band, but they have the potential to be a big hit here in Hong Kong.